This morning we all awoke to a wonderful message left by the post office on our machine. The baby chicks had arrived, and were ready for pick up! That was music to all of our ears. 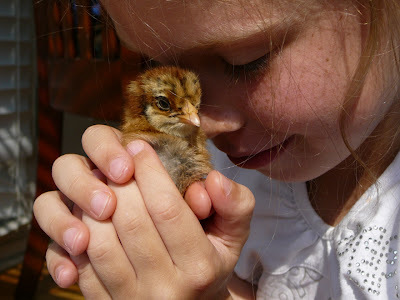 The sooner we could get the baby chicks home, the quicker they could receive their first meal. Two baggies of dry cereal and one bottle later, we hopped into the car to pick up our 10 clients who had flown in from New Jersey. The baby chicks received as much fanfare from the children as from the post office crew. Everyone had to take a peek into the small white box that housed some very loud peeping chickies. I was thankful to witness that all chickies were alive and accounted for, but it wasn’t until we got home and began inspecting closer that Grace announced, “Mom, we have twelve chicks, not ten.” Despite my request for no extra chicks (in order avoid the “males for warmth” additions) we had two more chicks. But the news was good, as I realized that one of the extras was another Silkie, reserved for pet chicken status. Quite the bonus considering they cost three times as much as the other chickens. After inspecting all bottoms for “pasting” and dipping each beak into the sugar water, the Knucker Hatch Twelve expolored a significantly bigger box. 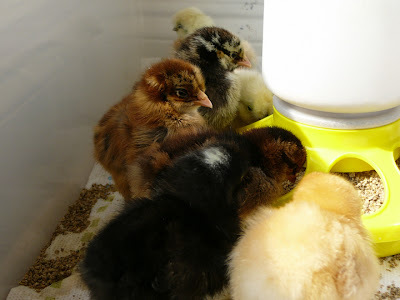 I made their first brooder out of an extended Sterilite bin from Walmart. For an hour we watched intently over the crew making sure all were drinking and eating properly, while taking in the musical chorus of peeping. It is a joyful sound. 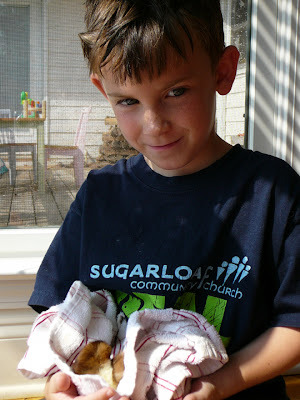 After one more hour, the children were allowed to hold the chicks. Each visit with each client involved much inspection, nuzzling, and naming. As of this evening, everyone is doing lovely except our Black Australop who, I confess, was bopped on the head by Faith’s hand while I was holding her. I’m not sure what came first, the bop to the noggin or her not feeling the best, but she just doesn’t seem to be behaving as lively as the others, and we have a bit of pasting issues beginning, however, I am hopeful that another 24 hours and she’ll be feeling better. 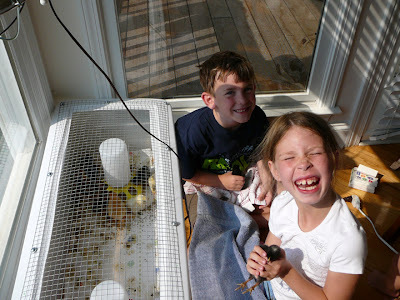 I am really thrilled with how much the children have taken to The Knucker Hatch Twelve. It should be a fascinating experience for all of us, and hopefully, a productive one. LOVE the pictures of the kids! Hope the little black one makes it, but it’s a good thing you got a couple of extras. Can’t wait to meet the new little members of your family.